Apple unveiled the Retina MacBook Pro at last year's Worldwide Developers Conference (WWDC), so it's about time we see a major update at this upcoming WWDC event in San Francisco June 10 through 14. A well known analyst Ming-Chi Kuo of KGI Securities predict that the 13-inch MacBook Pro with Retina display could get a new slimmer profile in addition to having its processor bumped up to the Intel Haswell chips. 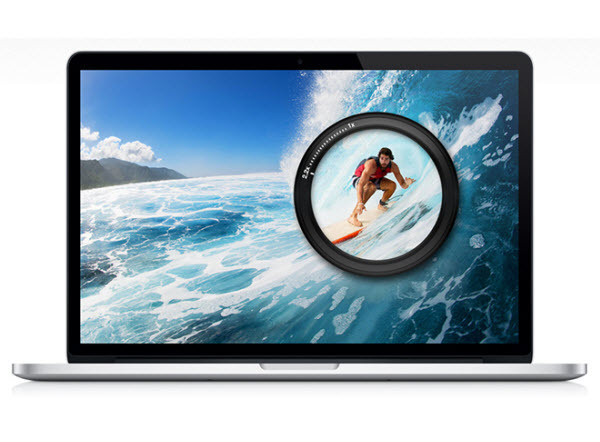 Retina MacBook Pro to be slimmer slightly, along with a camera upgrade. We expect the 13" Retina MacBook Pro will have a slightly slimmer form factor for increasing its portability. Also, we think the camera spec will be upgraded from HD to full HD. This will improve Facetime and video conference quality in the high resolution Retina display. Intel's latest-generation processors, known as "Haswell", which use a new 22-nanometer process, offering more horsepower with lower power depletion result in an extended battery life. The firm says the new design of the family's CPU cores is capable of delivering a 15% boost in performance, a 50% improvement in active-use battery life, and up to three times the amount of standby battery life when compared to the performance of Ivy Bridge. Currently, the MacBook Pro use Intel's Ivy Bridge processors. If Apple embraces Haswell, may be able to shave down the thickness of the premium laptop's design while providing customers with better battery life. In addition to Haswell, the improved high-definition FaceTime camera could upgrade the current resolution of 720p to 1080p, also known as "Full HD". Such improvements are just speculation. Let's see what Apple really has in store for us on the laptop front in exactly three days. Stay tuned! Seeking for free Mac DVD ripper? Here is a list of the top three free Mac DVD ripper for you to rip your DVD collections on Mac OS to MP4, MOV, FLV, MPEG, H.264, iTunes videos, etc for your iPhone, iPod, iPad. Apple iPad 5 release date nears, read our new iPad 5 rumours article to find out more, such as release date, features and leaked image.